Hello ... Hello ... my old friends ... It's great to see you once again! Following the transition in manufacturing and distribution provision for Jet Records from United Artists to CBS in 1978, ELO fans started to see the issue of 12" singles for selected ELO single releases from "Out Of The Blue" (JETDP400) and "Discovery" (JETLX500) with "Wild West Hero" (SJET12109), "Sweet Talkin' Woman" (SJET12121), "Shine A Little Love" (SJET12144) and "Don't Bring Me Down" (JET12153) also issued in 12" formats, in either yellow, purple, white and/or black vinyl. 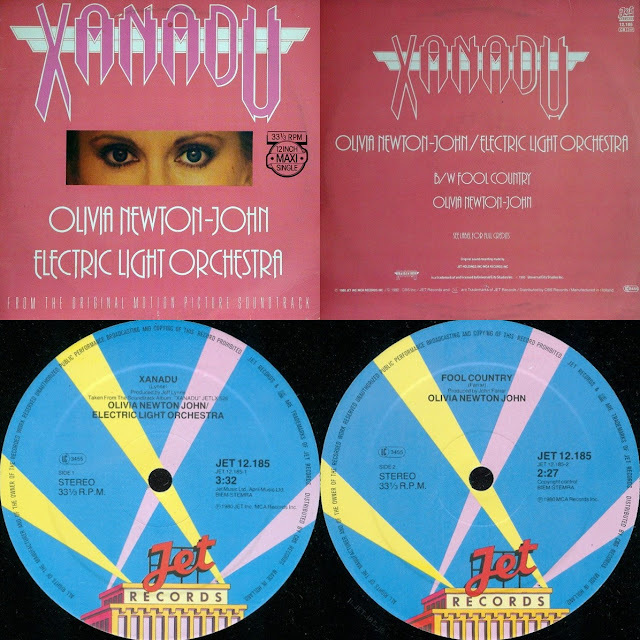 But when the OST for "Xanadu" (JETLX526) came along in 1980, ELO fans in the UK were treated to something new when two of the four ELO singles taken from the album were also issued as limited edition coloured vinyl 10" singles. 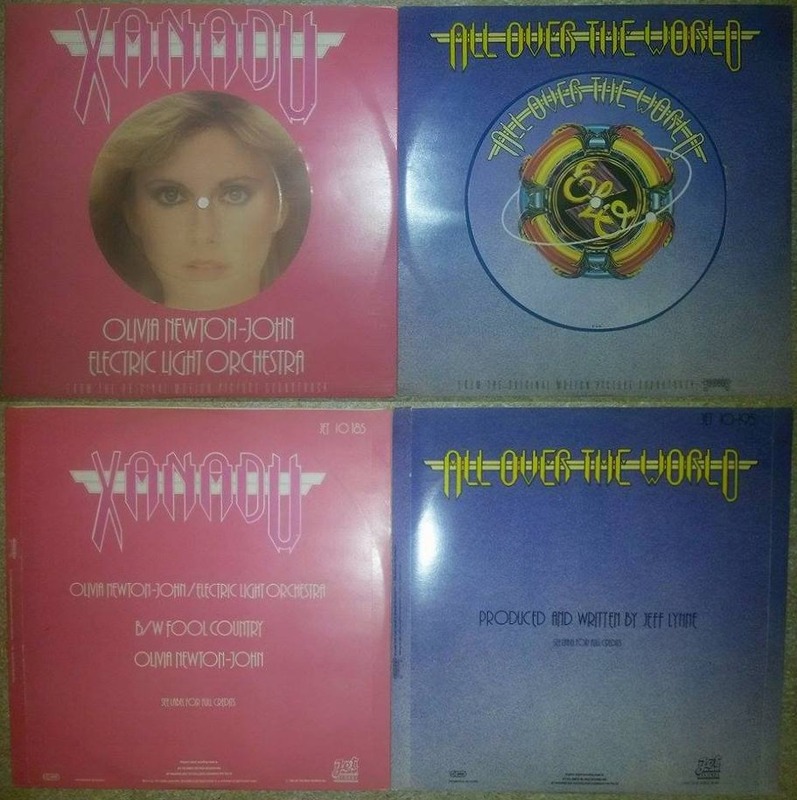 The chart topping duet with Olivia Newton-John: "Xanadu" b/w "Fool Country" (JET10185) and "All Over The World" b/w "Midnight Blue" (JET10195) were released in pink and blue vinyl, making them instantly a 'must have' for fans and collectors alike - including an almost teenage Yours Truly KJS! Note that a 33⅓ RPM black vinyl 12" single was issued instead of "Xanadu" (JET12185) in Holland for the European market. Regular visitors to elobeatlesforever (elobf) will doubtless also be aware that there is one other ELO 10" release out there, the ultra-rare double-sided 33⅓ RPM US promotional picture disc of "Xanadu" (MC10384). 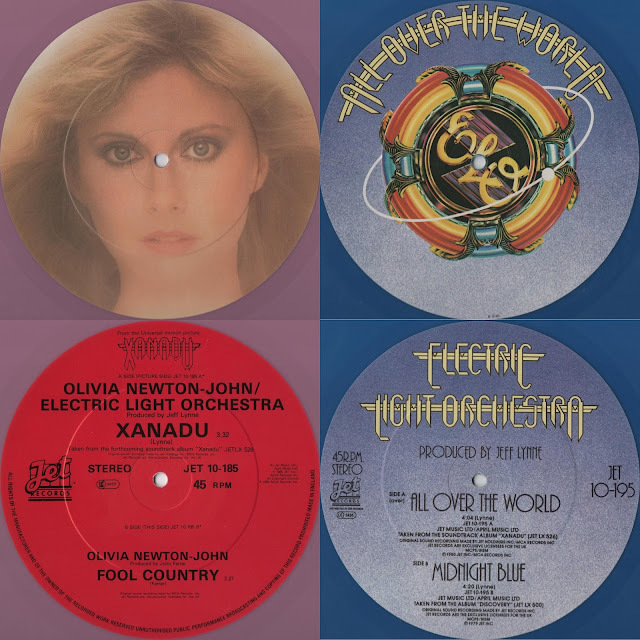 It is thought that just 31 copies escaped the pressing plant when the picture disc was culled reportedly due to Olivia's then unhappiness with her depiction. Copies of this particular 10" have regularly sold for amounts well in excess of $5,000 when they have turned up on eBay in the last few years. Without a doubt, being a fan and collector of ELO (and their extended family) records continues to be rewarding and sometimes surprising experience. You never know what will turn up next!